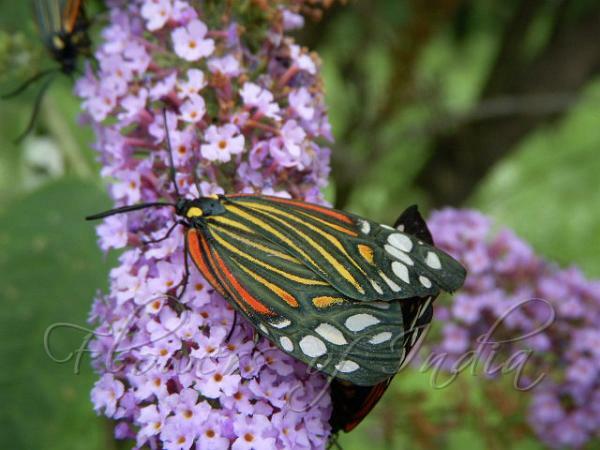 This plant is commonly called butterfly bush because of the hordes of butterflies (and bees) that are attracted to its wonderfully fragrant flowers. Butterfly bush is a deciduous to semi-evergreen shrub with a weeping form that can get 6-12 ft tall and have a spread of 4-15 ft. Butterfly bushes have opposite, 6-10 in, lance-shaped gray-green leaves on long arching stems. The tiny flowers are irresistible to butterflies. They are borne in long, 8-18 in, cone-shaped clusters that droop in a profusion of color and stay abuzz with winged, nectar-feeding insects from late spring until first frost in autumn. The flower clusters can be so profuse that they cause the branches to arch even more. The flowers of many cultivars are sweetly fragrant. Flower colors may be purple, white, pink, or red, and they usually have an orange throat in the center.